Grace Linczer ('16), a double-major in Anthropology and Peace Studies, will be leaving for Europe soon to do service work in Rome, thanks to The Dan and Cheryl Commers Endowment for the Nanovic Institute. 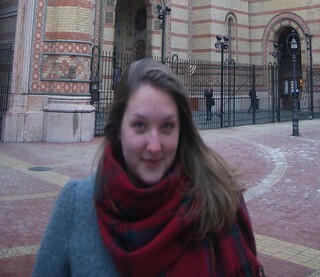 Before that, however, she received a Break Travel and Research Grant for Sophomores and Juniors to travel to Budapest to conduct research on the Dohany Street Synogogue. Her research was both academically and emotionally enriching. What follows is just a portion of her personal account of her travels! As I stepped from the Keleti train station, I caught my first glimpse of the Hungarian capital of Budapest. A patchwork of vibrant buildings gives an immediate visual narrative of the city’s elaborate history. Striking facades, spires and domes around the city endure as evidence of the myriad of peoples and cultures that have shaped the city’s lengthy history. One edifice, in particular, stands out against the skyline to the east of the Danube – The Dohany Street Synagogue. In 1859, this monument was erected in the part of the city called Pest, which was, at the time, a residential area for the Jewish community of Budapest. The largest synagogue in Europe, surpassed in size only by the Temple Emanu-El in New York. The Dohany Street Synagogue has witnessed decades of Hungarian history. Perhaps the most formidable episode that the Synagogue withstood was the Nazi occupation of Budapest in 1944. I had several goals in mind when I began my research within and around the Dohany Street Synagogue complex. Firstly, I sought to gain a more comprehensive view of the Jewish community in Budapest before the Nazi occupation. Next, I wanted to examine the actions taken by the Nazi’s in and around the Synagogue complex. By coming to understand how they transformed the Jewish quarter, I would be able to more fully grasp the corporeal and psychological traumas that the Jewish community suffered collectively. Finally, I intended to delve into the steps taken since the Holocaust to restore the Synagogue and surrounding neighborhood. I was afforded the opportunity to meet with a resident historian of the National Jewish Museum with whom I discussed many of the aforementioned questions. He gave me a tour of the synagogue complex and the surrounding Jewish quarter, allowing me ample time to field my questions. My research is based extensively on these meetings; additionally, however, I rely on records made available to me by the National Jewish Museum, as well as my own observations and documentation. I would like to extend my sincerest thanks to the Nanovic Institute for their generous support of my work. Traveling to Budapest was a truly invaluable experience, one that will be fundamentally important for the remainder of my undergraduate career, and perhaps further into my graduate studies. The Nanovic Christmas Break Grant allowed me to broaden my personal and academic perspectives by studying the Holocaust from the point of view of the Jewish community. Despite having studied the Holocaust in-depth throughout my academic career, nothing could have prepared me for the emotional experience of standing in the space were such unthinkable horrors occurred only seven decades ago. Nevertheless, I was struck by the poignant resilience and hopeful vitality of the Jewish community of the Dohany Street Synagogue. I am truly grateful that I was able to witness their efforts at rebuilding and healing their community despite all odds.